Infant Tummy Calm helps to soothe occasional gas and stomach distress in babies. When your little one is fussy and seems to have an unhappy tummy, try our Infant Tummy Relief! Some babies struggle a bit with gas pains, bloating, and general tummy discomfort. There’s not a whole lot we can do to help them! Some parents explore diet changes, leg bicycling, and tummy massage to help their infant’s discomfort (which are all great ideas). But sometimes, you need just a little something more to help baby feel better, fast. That’s where Infant Tummy Relief comes in! Compare it to gripe water — it’s got similar ingredients, but with no junk. Because you don’t want your baby consuming potassium sorbate or artificial flavors, right? We don’t use ingredients like those — and we never will. 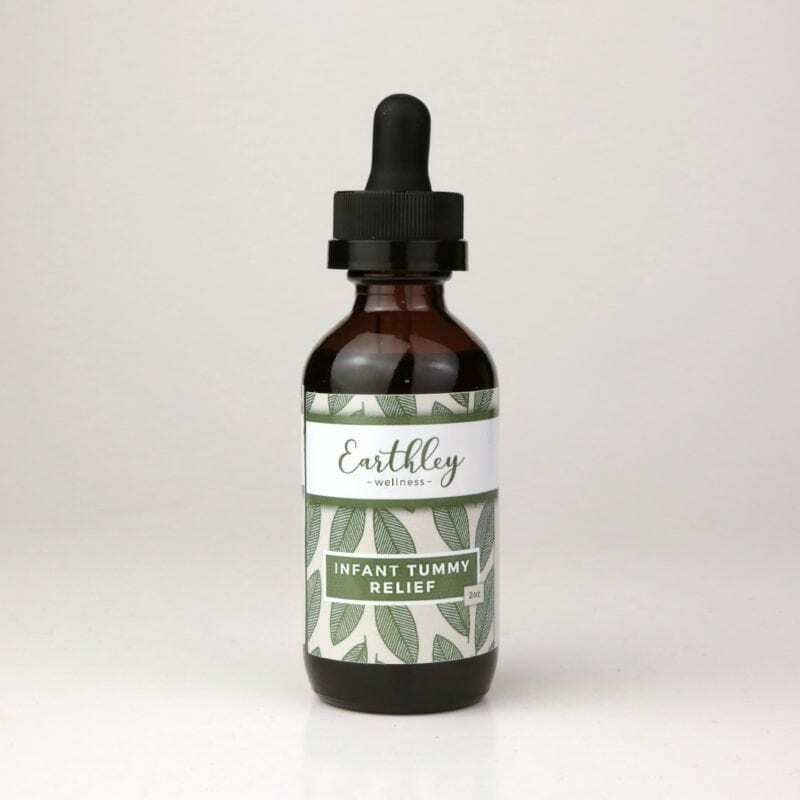 Our version is a pure, glycerin-based tincture that helps gently and naturally with tiny upset tummies. We also don’t use ingredients with allergens like soy, corn, dairy, nuts, gluten, and more. That makes this one of the safest options you can choose to help your little one feel better, fast. Infant Tummy Relief is safe for even very young babies in tiny amounts, to temporarily relieve gas or stomach distress. Try it instead of over-the-counter gas drops! Infant Tummy Relief is also safe and effective for older babies, children, and even adults for indigestion, upset stomach, heartburn, and more. Use it for all tummy-related needs! Organic ginger root, organic fennel seed, organic catnip, organic palm-derived vegetable glycerin, and filtered water. May be used for other types of tummy upset or indigestion. Shelf Life: 1 year. Safe for all ages. These statements have not been evaluated by the FDA and this product is not intended to diagnose, treat, or cure anything. This works instantly! My 3 week old was grunting and squirming for hours. The poor baby was so tired and couldn’t get to sleep because of it. I gave her a dose of this, and I kid you not, in seconds she drifted off to sleep in my arms. Awesome. My 4 month old can sometimes get very gassy which makes her miserable. This helps almost immediately! This works so amazing!! It’s worked on one of of little guys since he was 6 weeks old. He’s 16 months old now and still uses it when needed and gets instant relief!! Such a life saver for little with tummy issues!! Every new Mom needs two of these,one for the bag an one for the nursery! ;) Works well at relieving tummy troubles,gas,colic,etc… Recommend to friends n family!! Life savor! So safe, clean and quicks fast. I’m happy it has good and clean ingredients and is better than anything else on the market. Baby likes it as well! I was hesitant to use other options for infant tummy drops so when I saw the ingredients on this I was quick to order. My little guy gets very fussy when his belly rumbles and I give him a couple drops of this and he calms down within minutes. I love it, he even seems to love the taste! I’ve already ordered my second bottle! If I leave this at home we have to turn around to go get it! This is a constant in my shopping cart. My toddler is a picky eater and tends to like foods that cause upset tummy and gas. Infant Tummy Calm works wonders. Calms and settles his tummy in just minutes and I love that it only takes a few drops! My little guy has been using this since he was about 4 months old. It has definitely seemed to help when he’s had tummy troubles. It works quick and is effective, the most important things in moments like that! I love all of earthley products! This infant tummy calm helps my infant have less painful gas. I wish I had known about it when my baby was newborn & in so much pain. If I had known I would have stocked up to always have some on hand! Truly loved this when my son was little and even now for tummy upsets. I know it works because I’ll take it too! Love this stuff . Works great and only need to give my LO a couple drops. Must have!! Loved this — I used it when my littlest was a newborn and actually need to restock soon! I tried Tummy calm with my 6 week old when he was having severe gas pains. He hated the taste, but it worked like a charm and has been a staple while we are eliminating foods to see what is causing the upsets. I use it every few days now as opposed to a couple times a day but he has gotten used to the flavor now. We don’t need to use it often, but I’m glad we have it for the times my 9 month old has a bit of gas trapped in his stomach. He’ll burp within a few minutes of taking it. Great! Seems to help my daughter when she’s teething and has a tummy ache. I bought this because my new baby was having issues with colic. Ive never had a baby with Tummy issues so I was desperate to try any/everything. The tummy calm works almost instantly. Even if he is a little spitty from something I eat the tummy calm helps him. I give it to the older kids too! I would definitely recommend this for a baby with tummy troubles. This works great…sometimes. The first time we used it I thought I had drugged our little guy–he stopped squirming and went to sleep almost immediately. Other times, though, it hasn’t helped at all. Perhaps those times his fussiness just wasn’t gas- or tummy-related. I am really glad to have it in my medicine cabinet, though, because I know that even if it doesn’t help whatever is bothering him, it definitely does not hurt him! You can’t say that for some other OTC treatments for gas. My conscience rests easy! pre-revision infant colic is a nightmare. There is no gripe water better than this. *Please* get your baby evaluated by a qualified IBCLC, and look into the CO2 laser revision procedure from a periodontal pediatric surgeon. This works great for some tummy issues and just doesn’t for others. I find it helps my baby best when I give her doses before every nursing session. Just one dose rarely helps. It’s probably because of her specific stomach issue. We’re still figuring out why she has chronic tummy issues. Another amazing product 🙂 my girl has had tummy problems since birth. Now that she’s older it’s not as bad but still at 7 months we use this every now and then 🙂 It works instantly for her. I have used it before as well and it works great. Definitely recommend for anyone with an infant. I wish I knew about this when my babies were younger! My kids are 3 and 1.5 and I give it to them if they are having tummy troubles or reflux and it helps tremendously. Not just for infants!! Love it!! This was a lifesaver for our newborn daughter. She was very gassy and crabby the first few months due to a tongue tie and we used this all the time. It helped instantly! We use it still regularly for car rides because she hates riding in the car. I would recommend to anyone! I freaking love this stuff. Works amazingly well on yummy aches for me. I wish I had known about it when my son was a baby with frequent tummy issues. We’ve tried gripe water and Simethicone gas drops and neither of them really appear to work at all. But once we received Earthley’s infant tummy relief, we noticed results immediately. This truly helps our sweet baby so much, AND it’s natural! Works so well even when my stomach hurts. I just take extra! Love the taste too. Tried this for our baby that was constantly squirming, grunting, and crying if not adequately burped after every feeding. Between this stuff and chiropractic care, she rarely has any issues with gas anymore. So thankful to have found something that helped her feel better! My baby LOVES these drops! He knows exactly what they are and us so calm and relaxed aside from gas pains after taking them. BEYOND blessed to have found these. My 5 yr old and 1 .yr old dont have too many tummy issues, but when they do, this works great!